One inexpensive step for man, one giant leap for your budget. 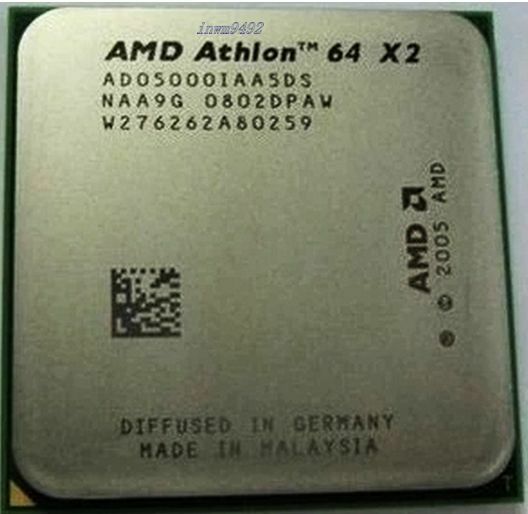 The 2.6 GHz AMD Athlon 64 X2 is a great little processor from 2005. Widely available used at a great price, these are great times indeed. Although not near as powerful as today's super CPU's. the Athlon 64 X2 will quickly accomplish almost any everyday task the average person requires. Unless you are rendering BD video or calculating the effects of climate change, this chip can easily handle several jobs at once - and they can be purchased used for 2% the cost of a new top of the line CPU. As it turns out, I ordered the wrong CPU for the motherboard. The ASUS A8M2N-LA motherboard that the HP/Compaq called NodusM3-GL8E used only Athlon 64 X2 CPUs at were rated at 89 watts not 64 watts like the one I ordered. So, I can't use them but I ordered them in good faith before I new what was the right CPU. The CPU did not cost enough to worry about returning it. My fault not theirs. Dealer is OK. Came earlier than suspected. Recommend. Had an old Compaq that was really slow with a 2.0ghz cpu. I searched online for processors compatible with the motherboard and found this one. Ordered and installed with no issues and wow it works much better. Great CPU, really great performance experience if you have Single Core before. As the description says . Dual-Core technology is like having two processors working together, each one taking care of his own job. You can play game, while you burning CD and while you scanning your PC with Antivirus soft. Your PC just can handle everything you want to do on it at the same time.